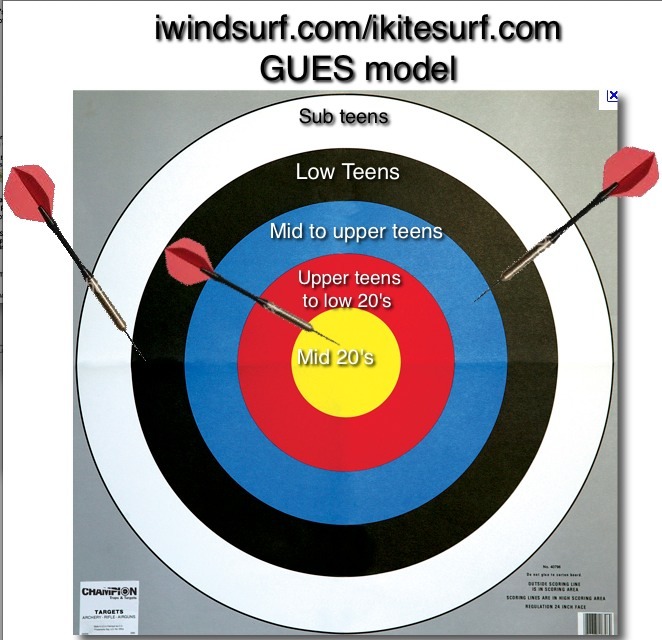 iWindsurf Community :: View topic - Upper level Lows and poor August winds. Upper level Lows and poor August winds. Posted: Tue Sep 03, 2013 12:11 pm Post subject: Upper level Lows and poor August winds. Perhaps you have noticed all the cranky comments perhaps brought on by the mostly crappy August winds. So for diversion let's take a look at some of the major factors behind this wind drought. Perhaps using our brains will reduce the bile. 1. They compact the isobars of the North Pacific High against the coast so the large scale pressure gradient goes up to the desert. 2. They deepen and push the marine layer clouds towards the corridor so dense air towards the coast creates a stronger local pressure gradient from about Viento to out east. 3. Their strong SW to W wind aloft hits the crest of the cascades creating turbulence that helps transfers some momentum to the surface wind. You experience this as strong wind with blasts at the Hatch that smooth out as you get further from the Cascades eg. The Wall. But this August has been different......Why? Again looking at the video find the upper level high pressure covering the western USA east and south of the Gorge. This feature has been anchored in this location for much of August. So a succession of pacific upper lows, that normally would produce late season wind events, have approached the Northwest only to be blocked by the this upper level high pressure. So they sit for a week or more west of the coast. And with time they induce a surface low pressure below the upper low that pushes the North Pacific High far to the south so the Gorge pressure gradient fades away. That leaves us with surface low pressure to the West and a scant marine layer so the Gorge wind engine sputters and fails and can even produce mild east wind. It looks like this blocking upper level high pressure will loiter along the coast for at least another day. Today it has wobbled towards us so the winds should improve even if UP AND DOWN. What will happen when this low finally comes over the Gorge? Looking at the video again you can see that we want the upper low to pass to our North so we are on the W to SW wind quadrant. Right now that does not look likely. You sure know what you are talking about, Mike. Never mind the Bay Area, it would be so great if you could do the forecast for The Gorge. I mean, you have the knowledge AND the local insight. And if, for some reason, the forecast is way off, we swear that we won't give you a hard time on the beach, won't we, guys? Posted: Thu Sep 05, 2013 2:11 am Post subject: Follow-up request. Please post a follow-up image(s) to show why it blasted today in the Gorge corridor. It was good wind! Yea, I know the theory of wind pretty well but it takes years of forecasting a place to learn recognize all the variables that impact the wind in ADVANCE to create a good forecast. What you see in my video and description above is a backcast. Which is sort of like explaining why the strock market crashed in retrospect. Much much easier than than forecasting. My experience when I first start forecasting in a new area e.g. Southern California is that it takes me about 5 years to discover enough of the variables to do a decent job and there are those in the Bay Area that would argue that even over 20 years experience does not insure a decent forecast. Actually I was to busy exhausting myself sailing to make a video. However watch the video at the top of the thread very carefully. Notice that on the very last 2 frames you can see a burst of SW flow coming out of the lower left corner heading towards the Gorge. That flow is from an upper trough at ≈ 18,000 ft. just south of the upper low you see spinning in the middle of the image. Having strong SW flow aloft adds a few knots to the surface wind in the corridor. So what would have been a mild upper teens to 20 days became interesting mid 20's days. Notice that the bulk of the wind still comes from the pressure gradient but the winds aloft gave the surface winds a slight SW cant (you probably noticed that on the water) and turbocharged them into the fun range. Once again, this is backcasting not forecasting and it would take me years to do the latter in the Gorge as well as the current forecasters unless I used the GUES model below. And I rather sail. Check out the Columbia River Gorge Blog for info on today's wacky Gorge weather. So it's that stubborn upper level high over the interior that should be the object of my August ire? Exactly! Upper lows and upper troughs normally are critical in out really strong wind days since the jack the wind velocities above the levels produced by the pressure gradient. But when the upper level high pressure blocks the eastward progression of the upper lows we have weak winds. Today and the last 2 days the upper low and upper trough are finally crossing the Gorge hence the stronger winds.